Not got much time, or just want these instructions in quick-to-read bullet points (no pictures, no waffling)? Click here to go to the Quick Read summary. 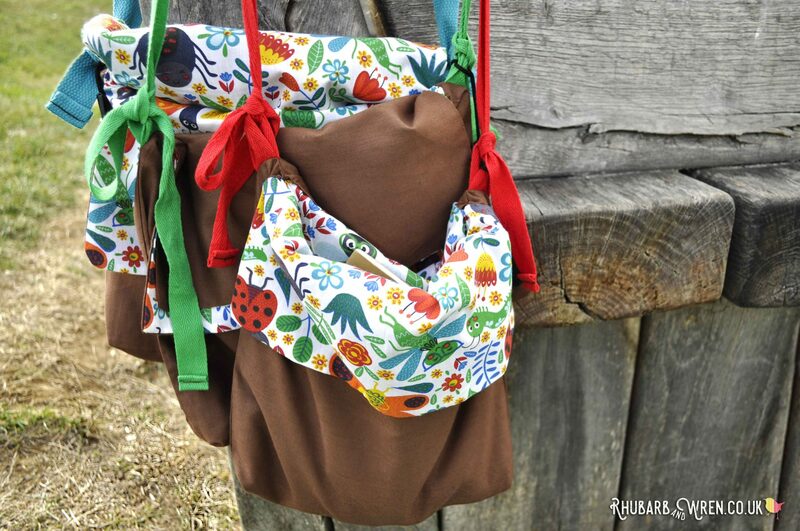 These nature explorer bags are meant to be worn slung across the body, messenger-bag style, over one shoulder. The two flaps can be folded across the same side to close the bag, or folded back on either side (showing off that fantastic lining fabric! ), so that the bag is open for kids to reach inside . Easy access to handy pockets and a spacious inside. It’s very easy, very casual and comfy, and not so big it’ll get overloaded but also not too small to be useful. Inside, they have pockets that perfectly fit a packet of small pencils and one of my homemade magnifying glasses. The pockets inside help keep things organised! 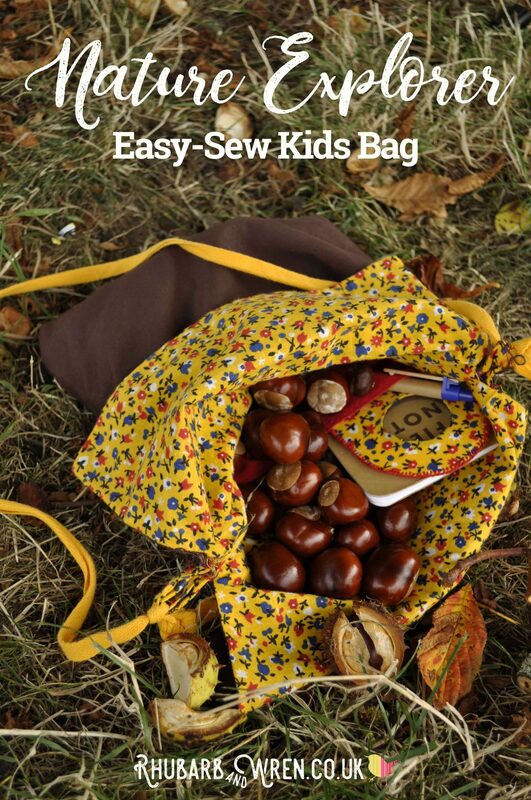 I made these for a summer camping trip with a whole group of kids, but they work just as well for autumn rambles or springtime nature walks – and the kids will love that they hold an awful lot of conkers, acorns, and sticky-bud twigs! Every explorer needs a bag to carry their supplies. Kids love being independent – and that includes carrying their own gear! Instructions for making a nature activity bag. 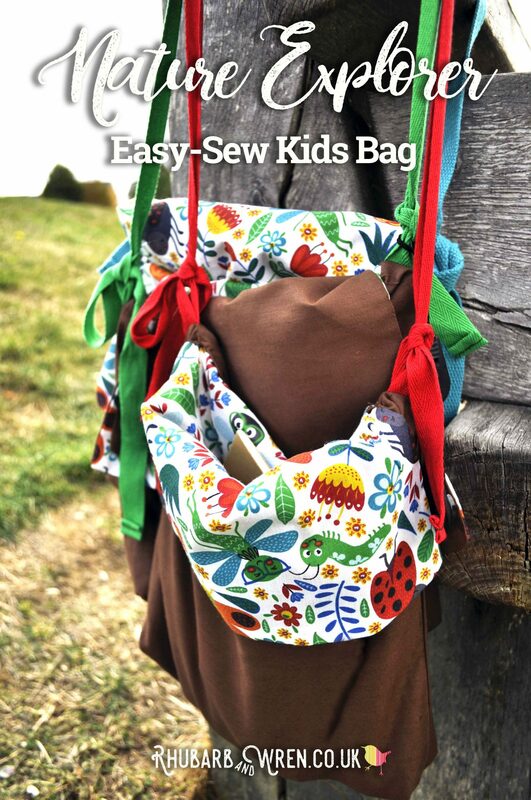 This nature explorer bag for kids is a great project for beginners; so don’t worry if you don’t have any experience with sewing before. It’s all straight seams and you could easily sew this by hand if you don’t have a machine. As a matter of fact it’s exactly the kind of project I made as a child (when your mother is an obsessive quilter, this is the kind of activity you grow up doing!). 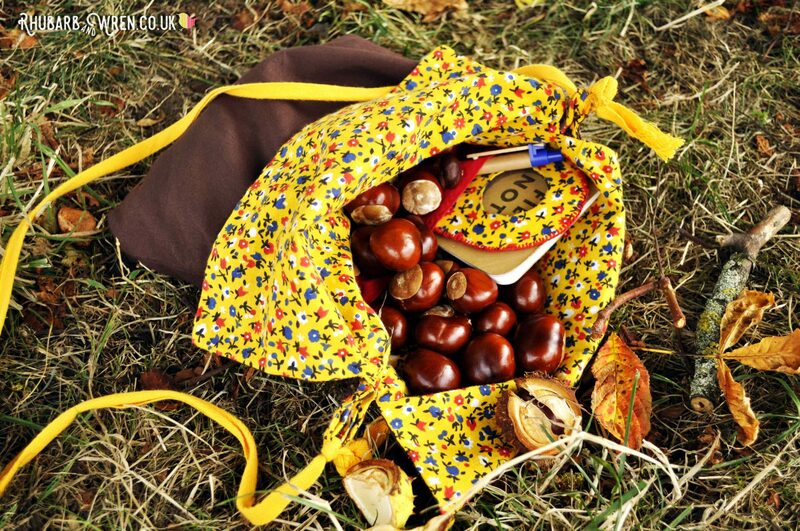 Not just for summer… a nature explorer bag is also great for conker hunting in the autumn! 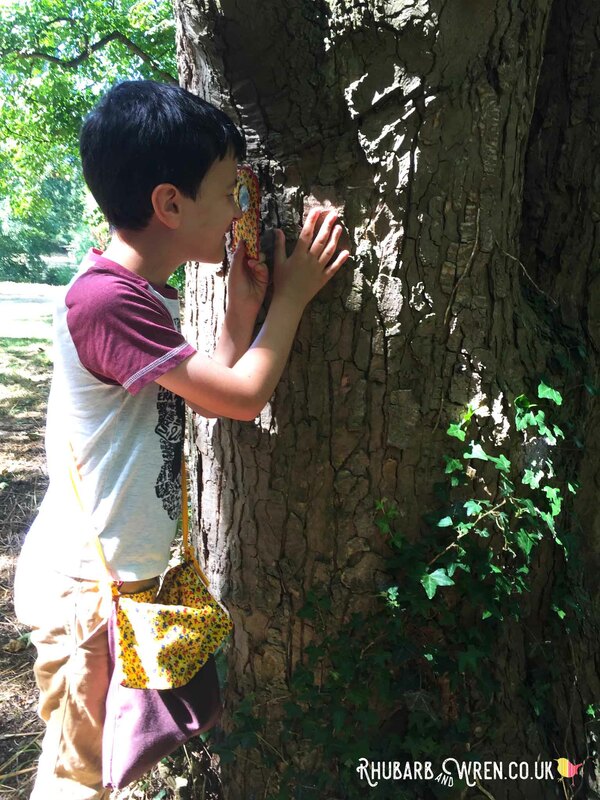 (Product links in this article are Amazon links to materials I used in this diy nature explorer bag project. These are all affiliate links – you can find out more on my ‘about affiliate links’ page.). 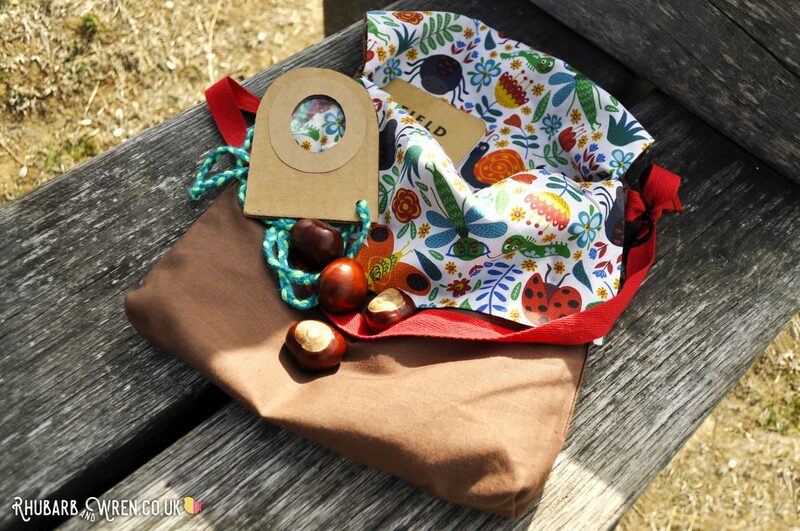 All you need to make this kids nature explorer bag! You’ll need a large rectangle of fabric for the outside of the bag. I used plain brown cotton sheeting because it’s really, really cheap; and I was making a dozen of these bad boys. Making this nature explorer bag out of linen, corduroy, or a heavy-weight canvas fabric would be lovely, but not in the budget for my project! 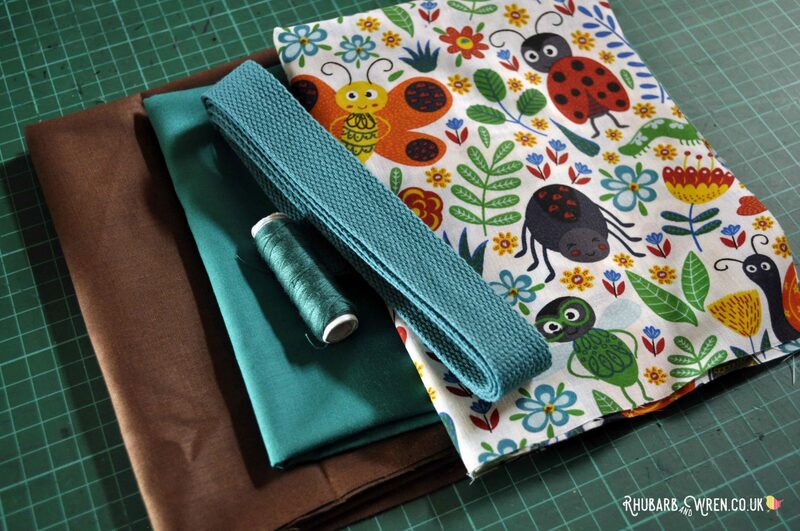 For the lining of the nature explorer bag, you’ll need another rectangle of fabric. You need the same amount of this fabric as the exterior. I made a prototype using yellow sprigged cotton, which my son decided was perfect for him. 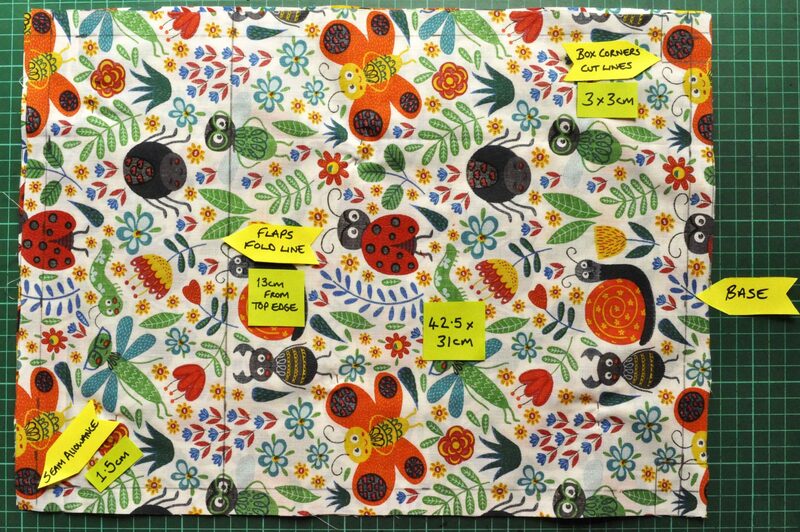 The rest of the bags I made using a bug-patterned cotton similar to this, this or this, because bugs = nature! I used a plain cotton fabric that contrasted with my lining so that the pockets were easy to find. Alternatively, you could just use some of the exterior or lining fabric if you prefer. My pockets are sized so that my pencils and magnifying glass fitted perfectly. And yes, that’s the fabric I used for the test bag that was nabbed by my son. This is for the bag strap and also the tabs that the strap attaches to. You can use anything for this, but woven webbing is strong, comfortable and comes in any colour you could possibly want. The kids will find plenty to fill their bag with, even if you give it to them empty! 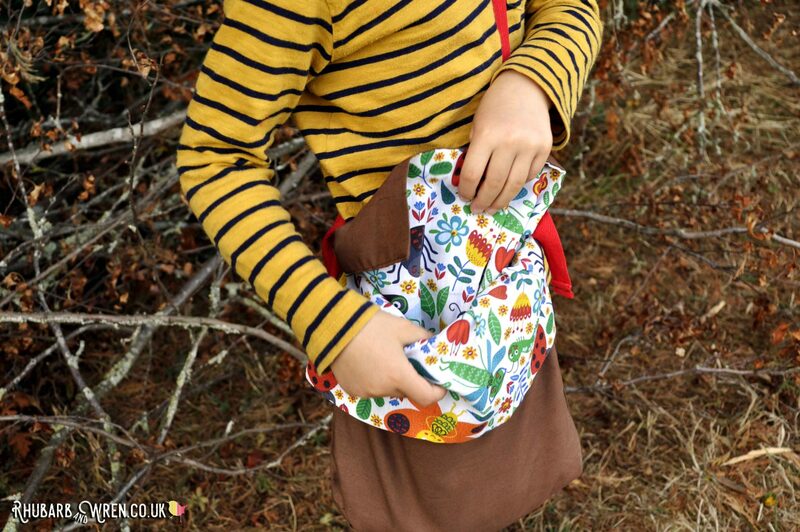 My nature explorer bag is a really simple pattern; basically just a few rectangles sewn together. My finished bags are 40 x 28cm/ (height x width), so are roomy enough to easily fit an A5-sized notebook, but small enough to be easy for kids of any age to carry comfortably. 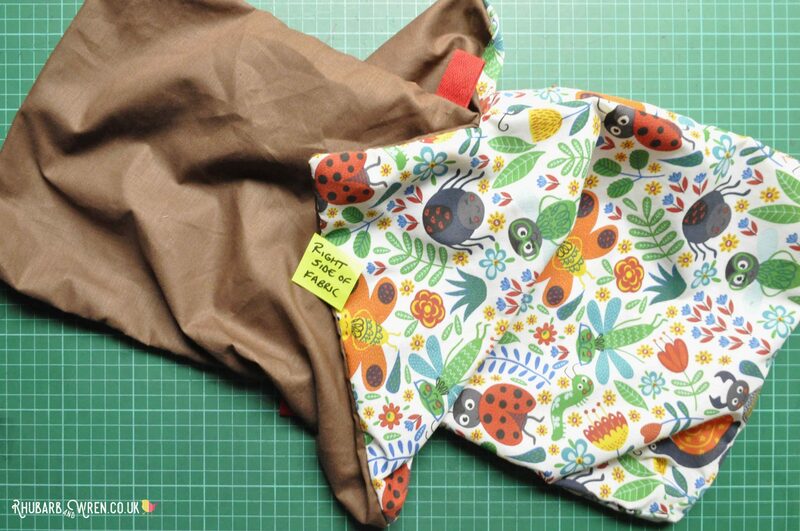 I used plain brown fabric for the exterior, and bug-patterned fabric for the lining. As I made a dozen (yes, really!) of these nature explorer bags, I made the pockets in five different colours to give a bit of variety, with webbing for the straps and tabs to match. First of all , start by cuting two rectangles measuring 43 x 31cm (height x width) from your exterior fabric. 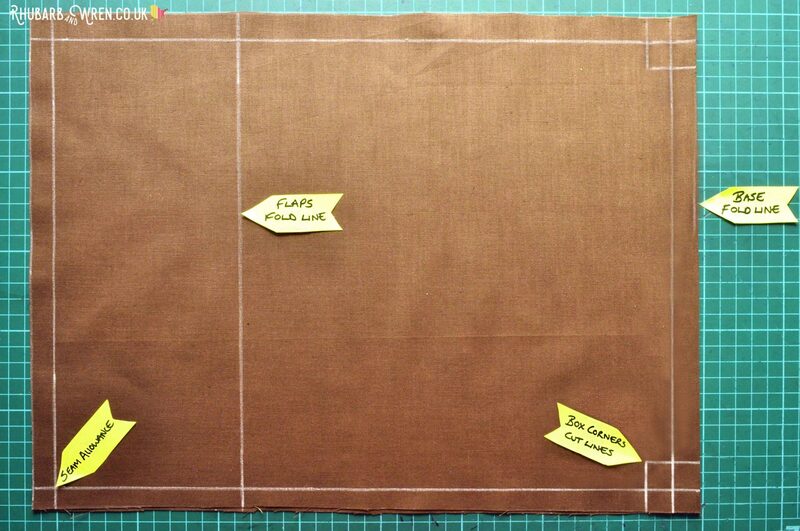 Then cut two identical rectangles, also measuring 43 x 31cm, from your lining fabric. 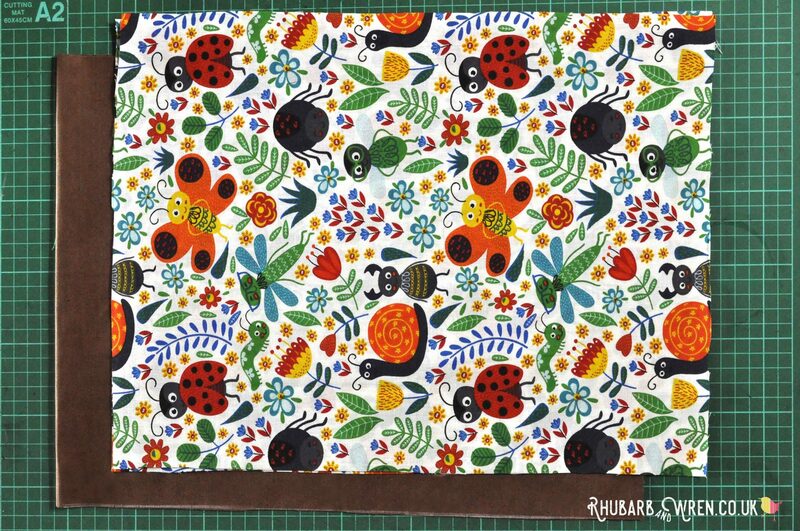 I love this bug fabric for this project! On one each of your lining and your exterior rectangles, use a pencil or tailor’s chalk to draw on the following guide lines. Parallel to and 1.5cm in from all four edges, draw lines all the way along. This is your seam allowance (the line that you’ll stitch along). You can do a smaller seam allowance if you like, but I like to use quite a generous one when making bags. Draw a horizontal line straight across the bag, 13cm down from the top edge. This line marks where the top of the bag folds over to make the opening flaps. Also draw on (but don’t cut ) 3 x 3cm squares at both bottom corners. This is where you will (eventually) cut to make the bottom box-shaped. Make sure these markings are on the WRONG side of the fabric. In other words, the side of the fabric that won’t be visible when the bag is finished. …and the same lines marked up on the interior fabric too. The next step is to make the two pockets, as these need to be stitched onto the lining before it is sewn together. 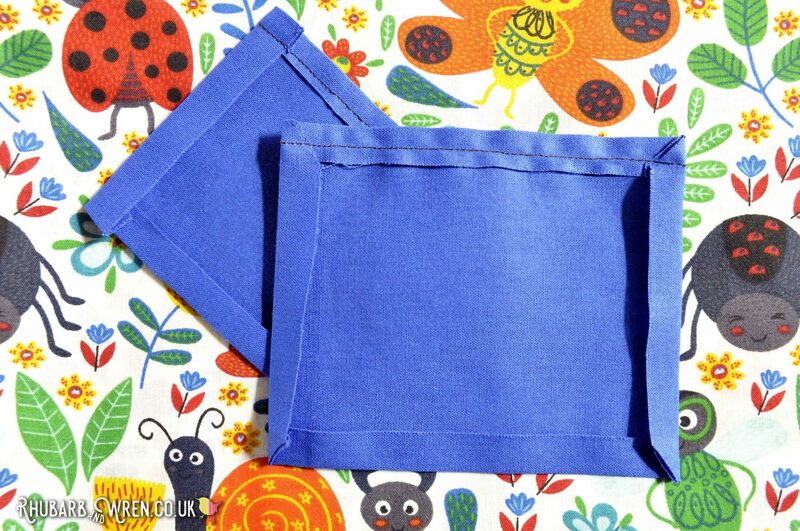 From your pocket fabric, cut out two rectangles 12 x 14cm and 10 x 12 cm (height x width). This includes a 2cm (or double) seam allowance on the sides and bottom edges, so the finished size of the pockets will be 4cm shorter and narrower. These are super-simple pockets so are quick and easy to make. Draw on the 1cm seam allowance (not the full 2cm). You’ll see why next! Once cut, fold all four edges over along that 1cm line (both rectangles) and press with an iron to fix the creases. Don’t skip the ironing – it makes the finished result much, much neater, and the process much, much, easier! With your pocket fabric right side up (and, again, on both rectangles), stitch along the top edge ONLY to hold those folds down. I did two rows of stitches, purely for decorative effect (you’ll see this in later pictures!). These edges will be the openings of your pockets. Folded and ironed pockets, with the top edge stitched down. Once the top edges are sewn, pin your pockets in position onto the right side of your lining fabric. 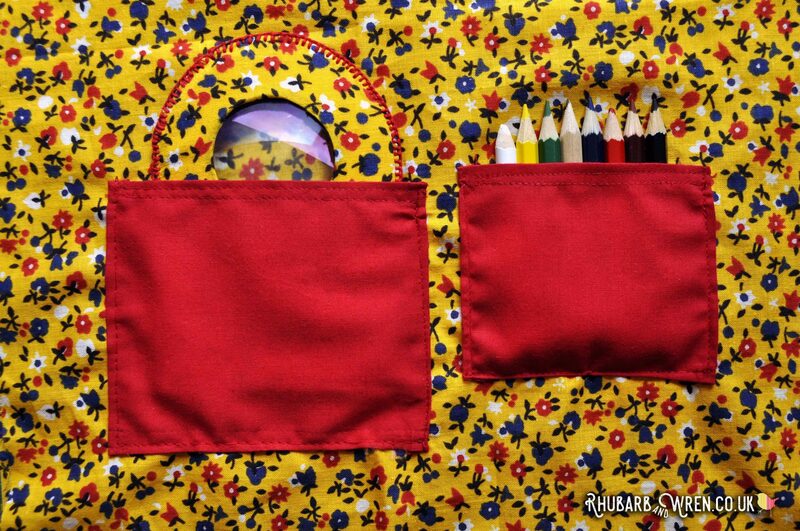 Be sure to attach your pockets to the right side of the fabric, and not too close to the flap fold line. Sew along the remaining three edges (not the top one) to fix them in place. Stitch the pockets down along three sides, leaving the pre-sewn edge open. Aaaand your pockets are done! Now it’s time to finish your lining. 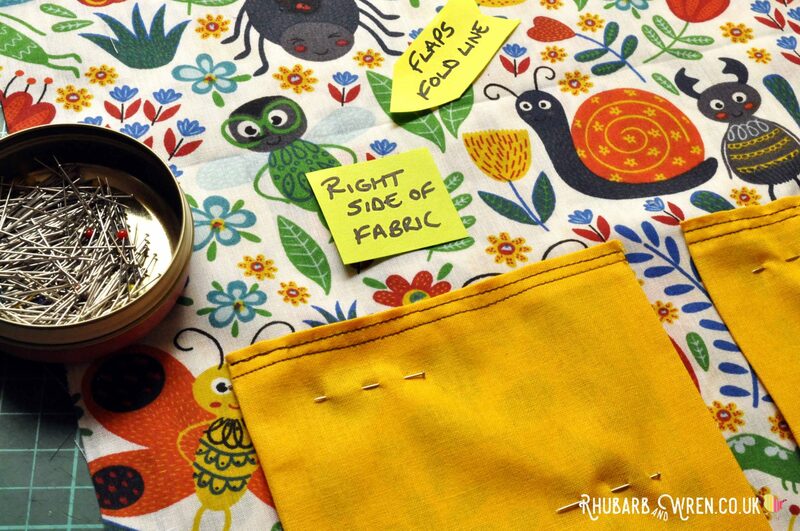 Pin your lining fabric together with the right sides together. This means your pockets should be on the inside. If your lining has a pattern, you should make sure that both patterns the same way up (if relevant) because otherwise your bag will look half upside down. If your fabric has a pattern, make sure both sides are facing the same way up! 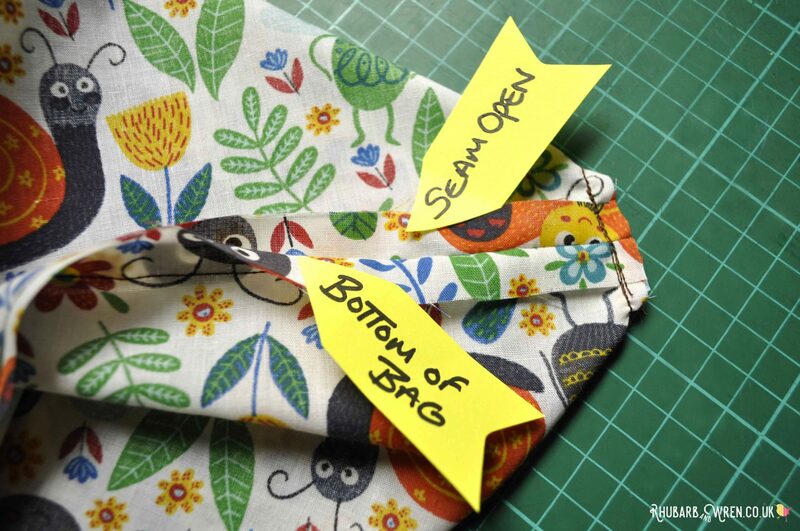 Starting from the fold line that you marked at the beginning, sew along your seam allowance down one side, across the bottom and up the other side, ending back at the fold line. DO NOT sew the parts of the sides or the top edge that are above the fold line. Sew the lining together (right sides on the inside) but don’t sew above the fold line. Almost done with the lining of your nature explorer bag. The last thing to do is to make the squared base. 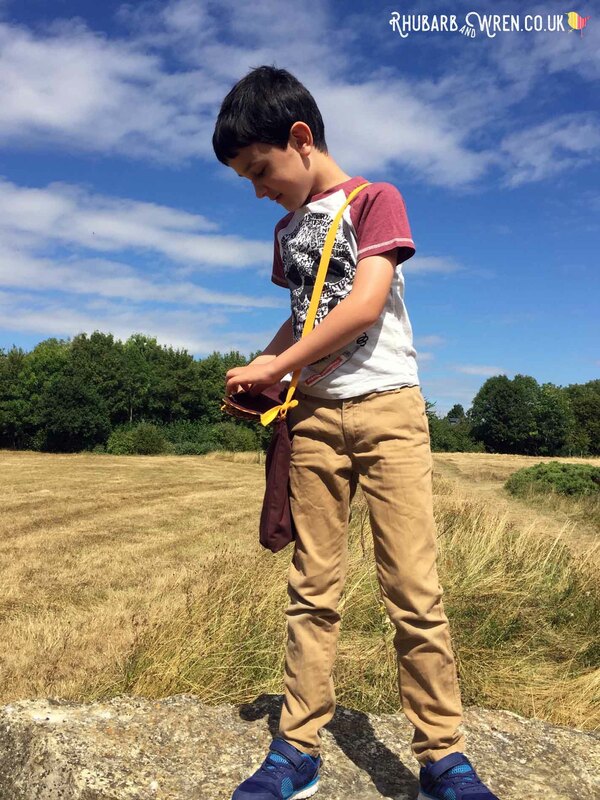 To make a small, flat base on your nature explorer bag, start by cutting out the 3x3cm squares in each bottom corner that you marked earlier. Don’t worry about cutting through your seam stitches here, as you’ll be sewing across these again shortly, which will hold the cut thread in place. Once you’ve sewn around the edge of your lining (but not the top section! ), snip off the 3x3cm squares you marked at the base. Open and fold both corners, as shown, to form a triangle that has the base seam running across the middle. Pin to hold in place, to make sure the seam is held open (as shown). A box base is easy to make and gives a bit of extra style to your bag. Stitch right along the raw edge you just created, including those cut seams. Once the corners are sewn shut, your box base is complete. And you have a boxed base! Your lining is now finished, so you can set that to one side for now while you make the exterior of the bag. 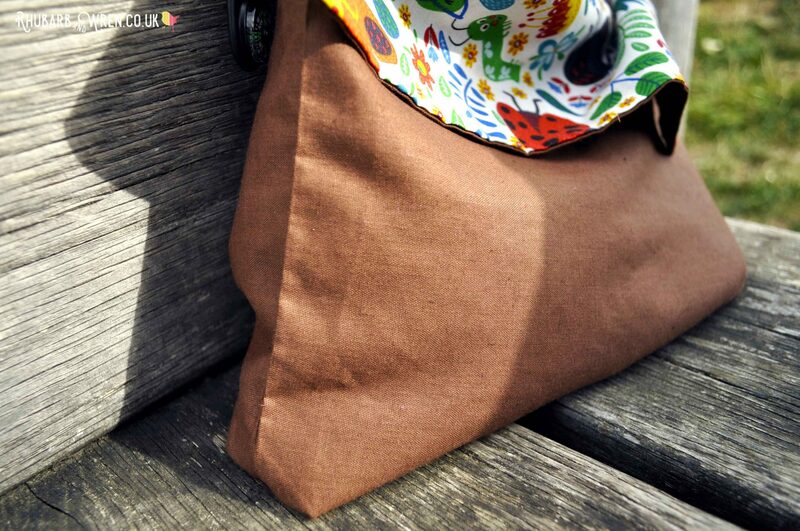 The exterior of the nature explorer bag is sewn together in almost exactly the same way as the lining. But there is one difference – you need to insert tabs into the two side seams for the bag strap to attach to. The tabs are loops on each side of the bag that the strap is attached to. They are sewn into the side seams so you need to pin them in place before you stitch the exterior together. So place your exterior fabric right sides together (with any pattern the same way up, as before). Position your tabs just below the flap fold line that you drew 13cm down from the top of the bag. The loop of your tab should be INSIDE the bag (between the two right sides); the ends therefore sticking out as shown. This is because you want that loop on the outside of the bag when it is finished so that you can thread the strap through them. Pin both pieces of fabric together and make sure the tabs are pinned to hold them in place. Sew your exterior fabric together exactly as you did for the lining – starting at the fold line and following your seam allowance down and right back round to the fold line on the other side. 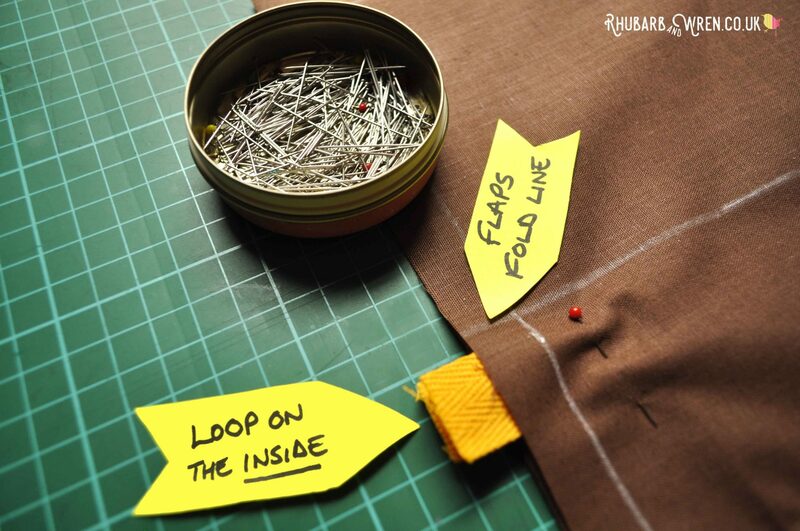 Repeat the steps to create a boxed base just as you did for the lining. Boxed corners as they look on the finished bag. 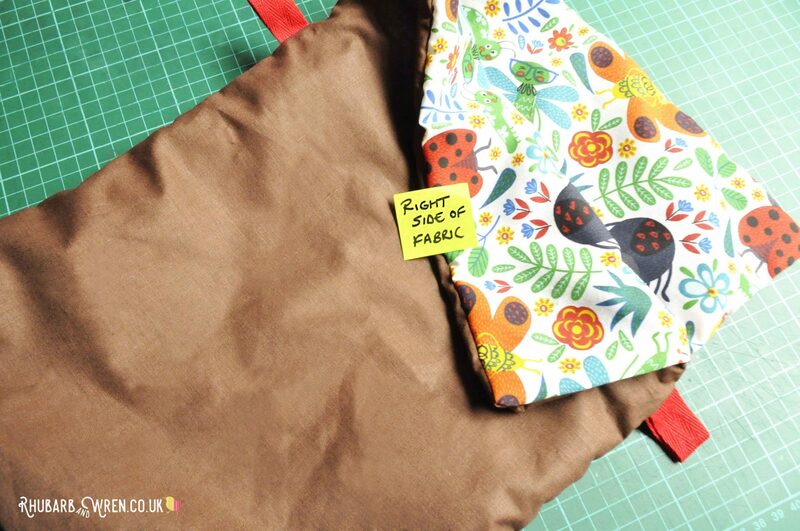 With this done, you’re ready to join the base and lining of your nature explorer bag together. 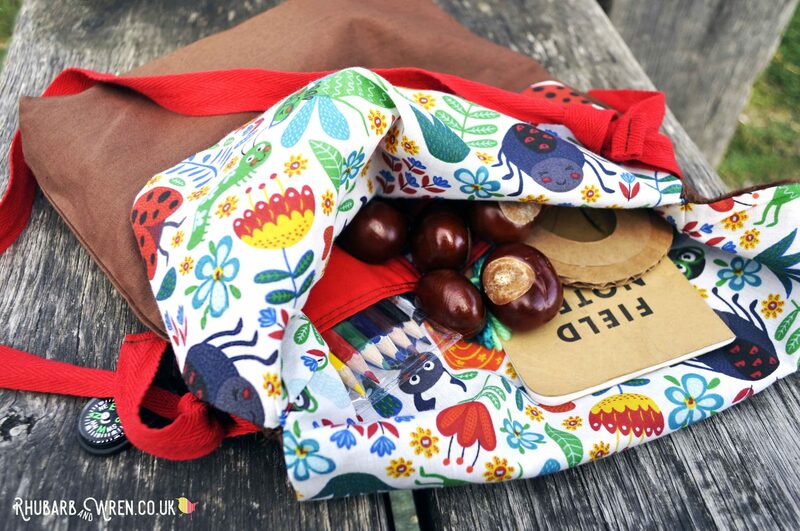 Turn your exterior inside out, so that the right side of the fabric is now on the OUTSIDE (just as it will be when your nature explorer bag is all finished). Leave your lining so that the right sides (the pocket sides) are on the INSIDE. Insert the exterior inside the lining, so that right sides of both interior and exterior are touching. Line up the lining and exterior fabric side seams, and make sure that the flaps are also lined up as precisely as possible. Pin together one layer of lining and exterior along the three sides of each flap. You should be able to look inside the bag now and see the WRONG side of the exterior, while the outside you see the WRONG side of the lining. Double check this before you sew anything else! 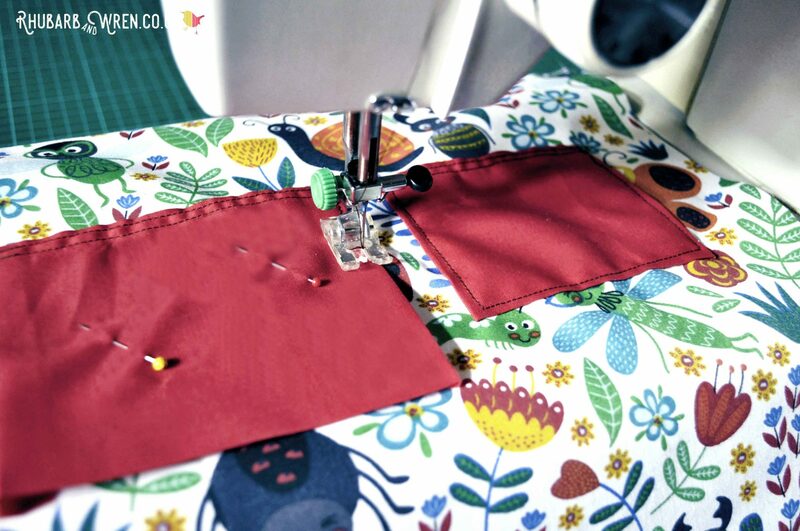 Pin the two flaps separately – one layer of lining and one layer of exterior fabric pinned together. From the fold line up, sew around TWO sides of one of the flaps to join one layer of lining and exterior together. Leave one short side open, because you’ll use this gap to pull the bag inside out again. Snip the seam allowance at the fold line on both sides, so that turning the flaps inside out will become easier. 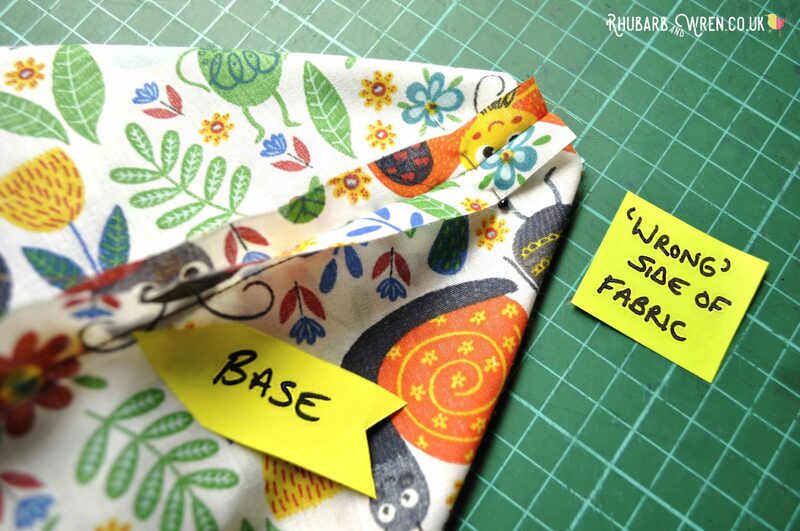 You only need to leave an opening on one flap so sew around all three sides of the other flap. 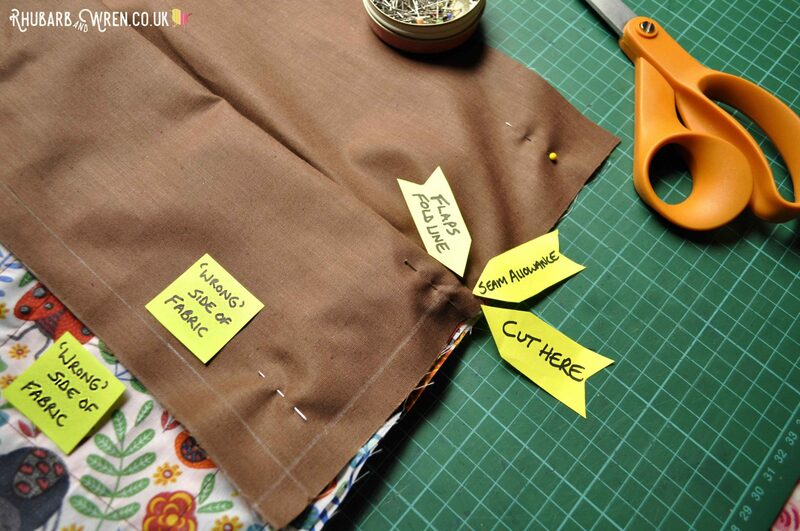 Pull your lining and exterior fabric through the gap you left in one flap, turning the whole bag inside out. This should result in you having both exterior and interior laid out in a long rectangle (with wings! ), right sides facing out. When you turn your bag inside-out, you should be able to lay it out like this, with all seams hidden and both lining and exterior fabric the right way out. Then push the lining into the exterior bag, which will make everything the correct way out. You’ll need to poke the base and flaps into place to get those corners neat, so use a blunt pencil for this. Hand stitch closed the hole in the flap, or alternatively use your machine to topstitch around the whole flap instead. So nearly finished! Just the bag strap to tie on. Last of all, attach your webbing or ribbon to one tab either directly or alternatively by tying a knot in the bottom and then threading it through the tab. In addition, I also threaded on a mini compass, because adventurers should always know the way home. Attach a compass to their bag and they’ll always be able to find their way home. 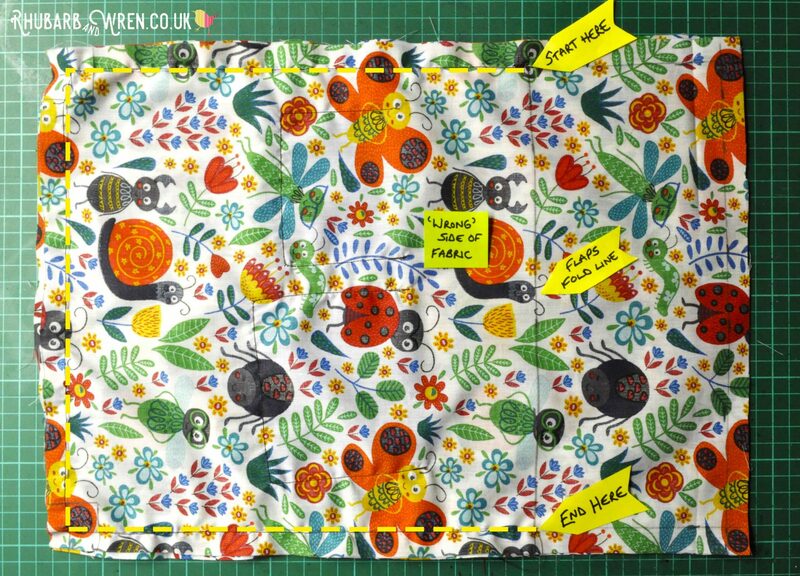 And that’s it – your nature explorer bag is done! Now that they have a bag, your little explorers will need to fill it with kit! Check out my homemade magnifying glass tutorial for an idea on what to include. Looking for more fun things to make and do with the kids? Take a look at these great activities! The easiest bag you’ll ever make! A bullet point summary for when you just want to get right to the point… Something not clear? Clicking on any of the headers will take you to detailed instructions (with pictures) above. ● Exterior Fabric– I used cheap cotton sheeting. 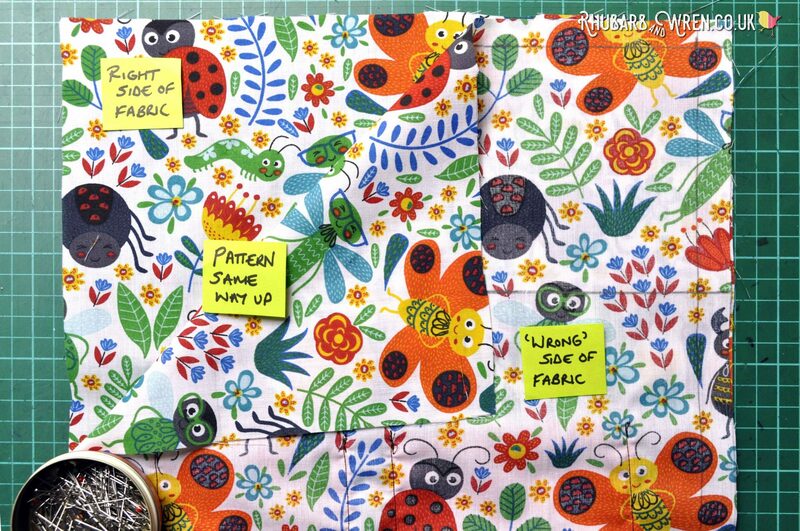 ● Lining Fabric – I used bug pattern fabric like this, this or this! 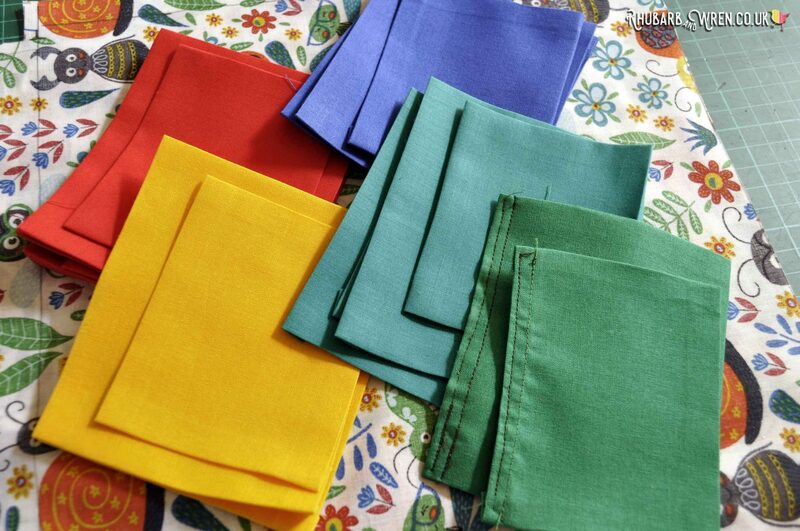 ● Pocket Fabric – I used plain colour cotton for contrast. ● Webbing – for the strap and side loops. 1. First, cut two rectangles measuring 43 x 31cm (height x width) from your exterior fabric. 2. 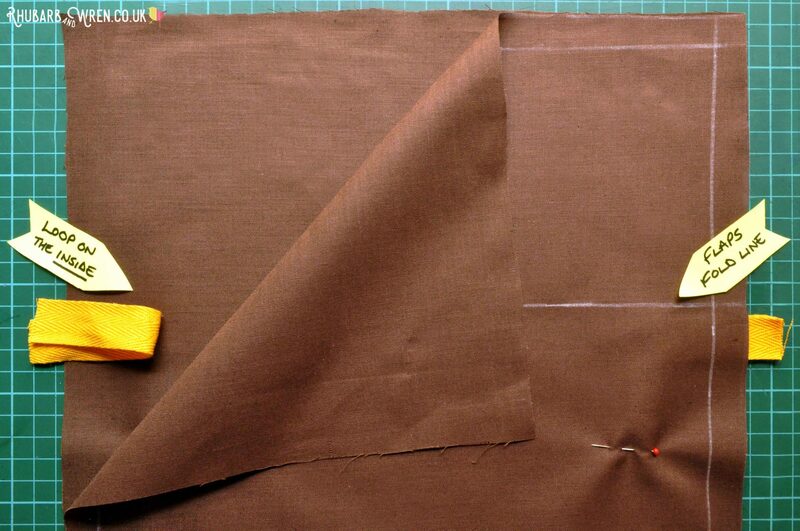 Then cut two rectangles measuring 43 x 31cm (height x width) from your lining fabric. 3. 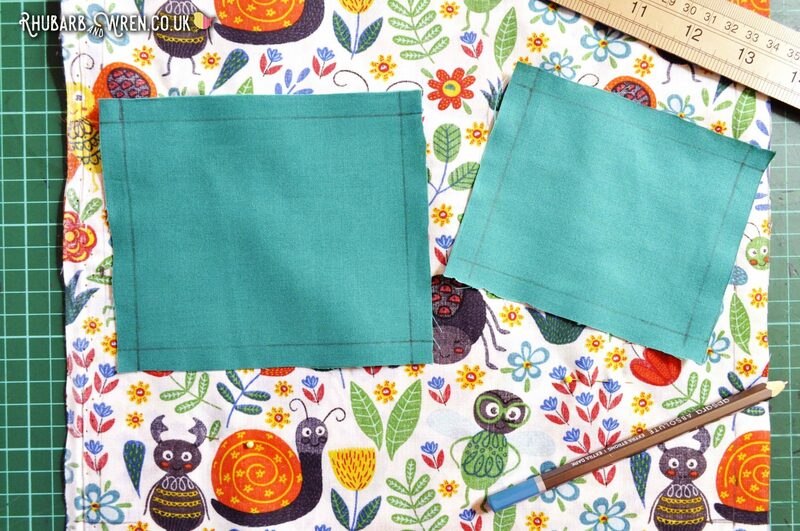 Next, cut out two final rectangles from the pocket fabric 1) 12 x 14cm and 2) 10 x 12 cm (height x width). 4. Finally, cut two short pieces of webbing for the strap tabs, and one long piece for the strap. 1. Mark the fold line of the bag flap on the wrong side of the lining and exterior fabric – a horizontal line 13cm down from the top edge. 2. Also mark out a 3 x 3cm square at each of the bottom corners (lining and exterior, as before). These are for the boxed base of the nature explorer bag. 1. Fold over 1cm along all four edges of the pockets. Press with an iron to fix these creases in place. 2. With the pockets right side up, stitch each one along the top edge ONLY. This is creates the opening of the finished pockets. 3. Pin the pockets in position on the right side of the lining (anywhere below the fold line). Sew along the remaining three edges to fix them in place. Your pockets are now finished. 1. Pin the lining fabric rectangles together; fabric pattern the same way up if relevant, right sides together. The pockets should be on the inside. 2. Sew the lining together, starting from the fold line down and back around to finish at the fold line on the other side. DO NOT sew above the fold line. 3. 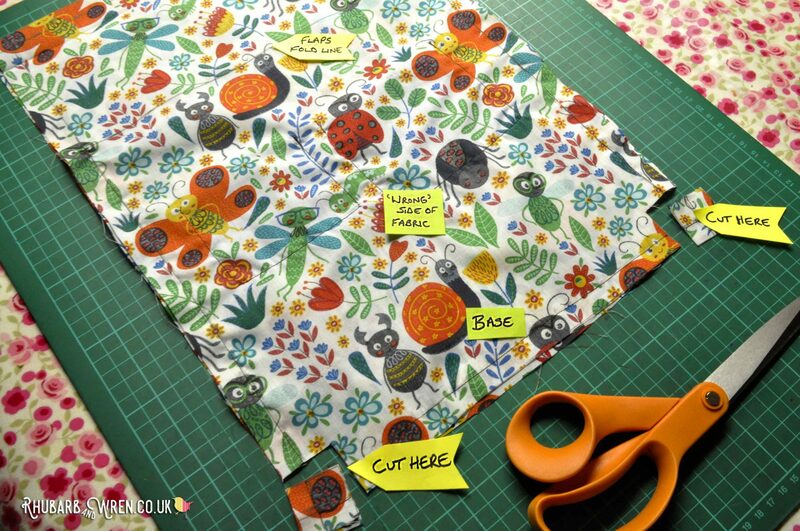 Cut out the 3x3cm squares in the bottom corners, cutting across the seams you just sewed. 4. Pinch the fabric to form a triangle with the base seam running across the middle. Pin in place then stitch along the raw edge just created. This closes up the bottom of the lining again and creates the boxed base. 1. Pin the two exterior fabric rectangles together exactly as per the lining. 2. Fold one of the short webbing pieces (for the tabs) in half. Insert the loop this makes in between the two exterior pieces, positioning just below the fold line. Pin in place and repeat with the other tab piece on the opposite side. So now, when you sew the exterior together, these tabs will be caught in the seam and fixed in place. 3. Sew the exterior exactly as per the lining – starting from and finishing at the fold line. Again, DO NOT sew above the fold line. 4. Repeat the process of creating the box base as per the lining, by cutting out the 3x3cm squares, pinching diagonally and stitching closed. 1. Turn the exterior right side out. Keep the interior right side in (so the pockets are still on the inside). 2. Insert the exterior into the lining, so right sides of the exterior and lining are touching. Line up the lining and exterior seams, and pin the unsewn top flaps together. DO NOT sew all four layers together as that would sew the bag shut. Pin one lining layer with one exterior layer on each side. 3. Sew the lining and exterior flaps together by sewing around three sides on one flap, but only TWO SIDES on the other flap. Leave one edge open. 1. Pull the lining and exterior fabric through the open edge in the flap, turning the whole bag inside out.So both exterior and interior are laid out in a long tube, right sides out. 2. Push the lining into the exterior, and use a blind stitch to sew the open flap edge shut. 3. Attach the bag strap by threading through and tying to the side loops. 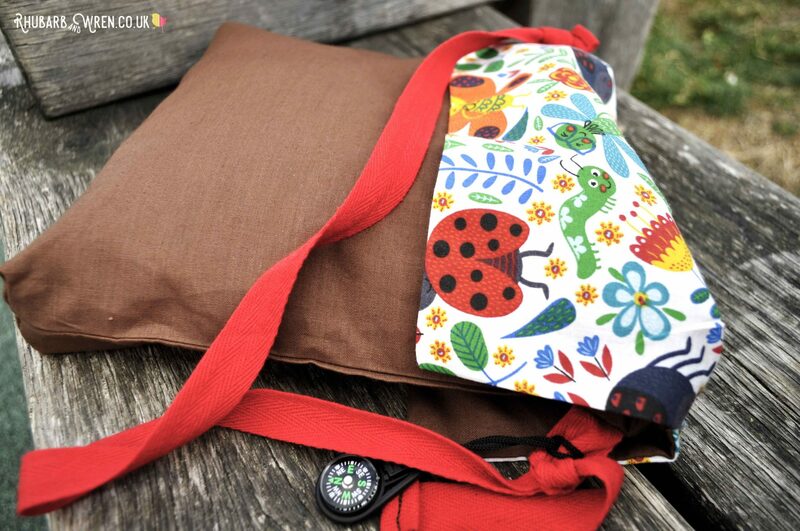 Your nature explorer bag is finished! Customise your bag with different colour trimmings, like I did. 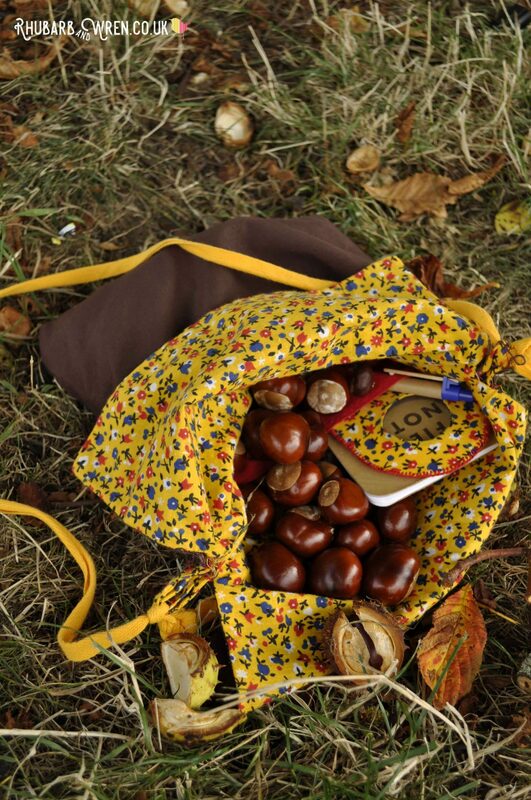 Conkers, acorns, leaves and twigs – the kids won’t be filling your pockets with their loot if you make them a bag for it all! Camping, Craft, Grown-up Stuff, Sewing. Bookmark. These bags are such a lovely idea. My daughter is forever asking me to put her “treasures” in my bag and I end up finding feathers and sticks in there for weeks to come. I love that children can be involved in picking their own fabric too so its totally unique to them. With my daughter, it’s often pebbles! And yes, great idea to get them involved in choosing colours and materials to make it extra personal to them! Oh, I hope you do – they really are very easy to make! This looks so good and something my twins really could do with as they always want to collect things on the walks! Pinning this! Oh I love this it’s so cute and those colours are perfect.